“When I first entered [the dark web] about five years back, I couldn’t go to sleep for days. It is disturbing.” This is one of the first things Ritesh Bhatia said during his presentation at the 2019 ACFE Fraud Conference Middle East. 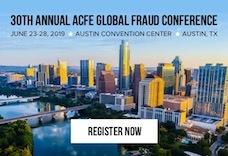 Bhatia’s session, “Dark Web Threat Intelligence and Investigations,” focused on what the dark web is and why fraud examiners need to be familiar with it if they want to stay ahead of fraudsters.